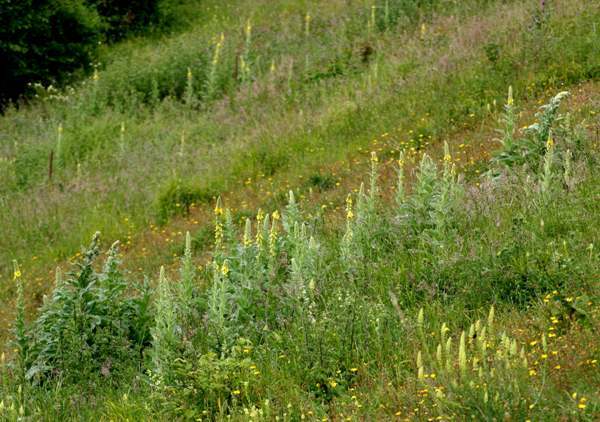 There are several Mullein species, but Great Mullein truly deserves its common name because it can grow to a height of two metres, although little more than half that height is more usual. The leaves of the Great Mullein are hairy, giving this plant a downy white appearance. The individual yellow flowers are typically 25mm across but, unlike foxgloves, the lower flowers do not necessarily open first. 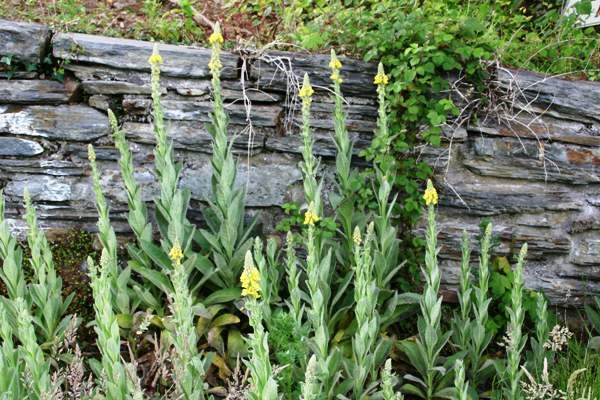 Great Mullein is common and widespread throughout Britain and Ireland except for the far north. This wildflower is also found in most parts of mainland Europe including the Mediterranean region, where it thrives despite the long dry summers, and in northern Africa and parts of Asia. In North America, South America and Australia Verbascum thapsus is an introduced alien species. 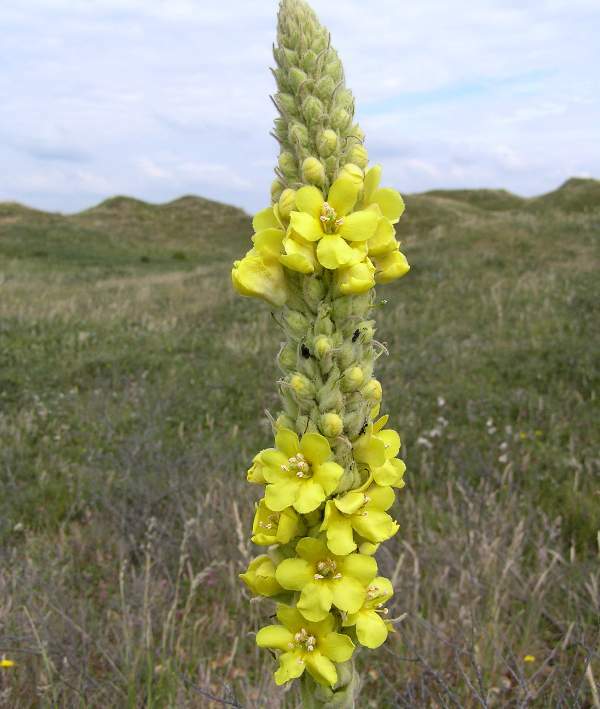 Great Mullein is a plant of dry, sunny places including coastal sand dunes. These striking flowers, which in Britain and Ireland can be seen in bloom from June through to August, are usually at their best in July. 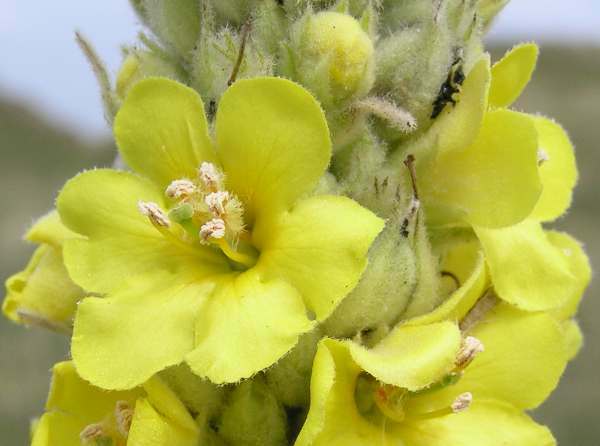 Great Mullein has long been used in herbal medicine, where its emollient quality (as a skin moisturiser) and its astringent properties have been exploited. Many other benefits have been claimed for this plant including anti-inflammatory, anti-tumour, antifungal and antibacterial effects. Its analgesic properties are also widely reported, and there have been cough mixtures based on mulleins. Other past uses for this plant have included the dyeing of fabrics. The specific epithet thapsus means 'from Thapsus', an ancient (now ruined) village near Carthage, in Sicily, and so as you might expect this wildflower is indeed very common on Sicily. Wavyleaf Mullein Verbascum sinuatum is a southern European species with (as its common name declares) wavy-edged leaves. The pictures shown on this page were taken in North Wales in July.